Hitting harder and moving more explosively than ever, Rafa Nadal raised the bar of men’s tennis another notch during his defeat of Novak Djokovic in the U.S. Open final on Monday. Rafael Nadal on Monday ruled out an assault on a calendar year Grand Slam, a mission so intimidating that only two men have ever achieved it in the sport's history. The 27-year-old Spaniard clinched his second US Open, and his 13th career major. Nadal completed a career Grand Slam in New York in 2010, but winning all four majors in the same year has only been achieved by Don Budge (1938) and Rod Laver (1962 and 1969). Out-of-favour players Virender Sehwag, Zaheer Khan and Gautam Gambhir were today handed a lifeline for staging a comeback to the national team as they were included in the India 'A' squad for two four-day games against visiting West Indies ‘A’ next month. Yuvraj will lead India Blue in the Challengers Trophy. Shikhar Dhawan said he was now reaping the fruits of 17-18 years' of hard work, and he if maintained the same tempo, he was sure of retaining his place in the Indian team, despite tough competition. “Competition has always been there. It depends on how you take it. If I do well, I will be there in the team”, said Shikhar, who returned from Australia today. Ashok Menaria returned with a five-wicket haul before Unmukt Chand and Mandeep Singh cracked individual half-centuries to guide India A to a convincing six-wicket win over New Zealand A in the second one-dayer of their unofficial ODI series here today. The International Hockey Federation (FIH) has announced that it has received seven “high quality” bids from five nations, including India, for hosting hockey’s marquee events. Double Olympic medallist Sushil Kumar feels the massive reprieve to wrestling will motivate the Indian grapplers in the upcoming World Championships and they will return from Budapest with more medals. In the short term, it now looks just a matter of time before the Mallorcan powerhouse returns to the top of the world rankings; more significantly, Roger Federer’s record of 17 grand slam titles is no longer a speck on the horizon. Nadal’s 6-2 3-6 6-4 6-1 victory over Djokovic at Flushing Meadow took the 27-year-old’s major haul to 13 and the nature of it suggested he is again set to take a stranglehold at the top of the men’s game. Djokovic threw everything at Nadal during the latest enthralling chapter in their rivalry and for a while during the third set he looked to have gained the upper hand only for Nadal to steam past him and claim a second U.S. crown. Who would have thought it at the start of the year? When Lukas Rosol sent Nadal’s tennis world spinning off its axis at Wimbledon in June last year, it seemed the wear and tear on the Spaniard’s knees had finally caught up with him and he did not hit a ball in anger for seven months. Yet since re-emerging at a low-key claycourt tournament in Chile in February, the Spaniard has been virtually unstoppable, winning 10 titles, including an eighth French Open, and proving that his knees can withstand the pounding of hardcourt tennis. When he returned from his injury lay-off it seemed reasonable to assume his main focus would be the French Open. Yet Nadal, who once used to look slightly less menacing on faster hardcourts, has added spice to his serve and extra speed to his forehand to turn himself into the concrete king with Masters titles in Indian Wells, Montreal and Cincinnati before his rampage in New York. Worryingly for his rivals, Nadal’s fabled defensive skills have been embellished with more firepower. His forehand has lost a little of the loopy topspin that used to wear down opponents and a slightly flatter, more net-hugging adaptation has been in evidence which enables him to attack much earlier in rallies. The left-handed serve has been a revelation too. 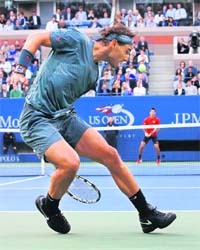 Nadal held 88 consecutive service games at the U.S. Open before the semi-final in which Frenchman Richard Gasquet managed one break of a delivery that, while not as fast as some, is deadly accurate and heavy with spin. Djokovic did break it three times but an irresistible Nadal always had an answer as he roared to victory. 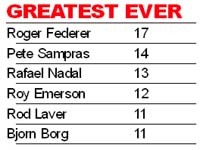 As ever, Nadal refused to get drawn into the numbers game after his latest career milestone, saying simply that 13 was already “more than I ever dreamed of”, but those who have watched his latest comeback are more emphatic. 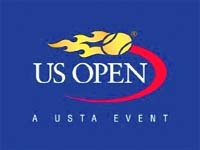 McEnroe’s sentiments were echoed by another former U.S. Open champion, Boris Becker. “Nadal has performed at an unbelievably consistent level throughout the year, every match he has played he’s been close to perfection,” the German told Sky Sports. Peerless on clay, Nadal, fitness providing, could feasibly take his French Open haul to 10 or more and after his showing on hardcourts this year he could have several more title runs in Australia and New York. Wimbledon is problematic, coming so soon after the claycourt season, as it proved this year when he lost in the opening round to Belgian Steve Darcis. Rafael Nadal on Monday ruled out an assault on a calendar year Grand Slam, a mission so intimidating that only two men have ever achieved it in the sport's history. The 27-year-old Spaniard clinched his second US Open, and his 13th career major. Nadal completed a career Grand Slam in New York in 2010, but winning all four majors in the same year has only been achieved by Don Budge (1938) and Rod Laver (1962 and 1969). “To win all four Grand Slams in one year I think today is impossible for anyone. That's my feeling,” said Nadal, who now has eight French Opens, two Wimbledon, two US Open and an Australian title amongst his 60 career crowns. Sunday's win capped a memorable year for Nadal. Yuvraj Singh, another player who find himself on the sidelines, was also given an opportunity to force his way back into the ODI team after being named captain for the three-match unofficial series and lone T20 match against West Indies 'A' beginning September 15. The squads were named by the BCCI senior selection panel which met here today. All the four players have been out of the Indian team since early this year. They will play under Cheteshwar Pujara in the second and third four-day games at Shimoga (October 2-5) and Hubli (October 9-12), the Cricket Board said in a media release. The trio of Zaheer, Sehwag and Gambhir were not named for the first four-day game that will be held at Mysore from September 25-28. Jammu and Kashmir all-rounder Pervez Rasool has been picked for all the three matches for the unofficial Test series. Yuvraj, who played his last international match in January in an ODI against England, will lead a 14-member One-Day and T20 team which has the likes of Unmukt Chand, Robin Uthappa, Yusuf Pathan, Irfan Pathan, Jaydev Unadkat and Praveen Kumar. All the three matches of the unofficial ODI series will be played in Bangalore on September 15, 17 and 19. The lone T20 match will also be played there on September 21. The selectors also picked the India Red and Blue teams for the NKP Salve Challenger one-day series, scheduled at Indore from September 26-29. Shikhar Dhawan said he was now reaping the fruits of 17-18 years' of hard work, and he if maintained the same tempo, he was sure of retaining his place in the Indian team, despite tough competition. “Competition has always been there. It depends on how you take it. If I do well, I will be there in the team”, said Shikhar, who returned from Australia today. The 27-year-old Delhi south paw, with twirling moustache and open chest, said the 150-ball 248 knock was a high point in his career, particularly as it was the second highest in this category (former Surrey batsman Alistair Brown holds the record with 268), and it took him past the 200-plus knocks of Sachin Tendulkar and Virender Sehwag. Sadly, he got no congratulatory message from either of them. “Perhaps, they will hail my feat when I meet them,” he said with a big grin. Dhawan said playing in South Africa was a great experience as the wickets were different. “The bounce, pace, weather, breeze…these were the things we had to adjust with. All this will play a big role when India tour South Africa,” Dhawan added. He said the senior team would be able to do well in their forthcoming tour of SA, as the players were well prepared. “Our batting is good, and bowling is good too. We are winning matches…we should do well in South Africa. The boys are confident of doing well,” he noted. Menaria weaved his magic at the Dr YS Rajasekhara Reddy stadium to return with figures of 10-0-38-5 to help India A dismiss New Zealand A for 216 in 47.2 overs after skipper Chand had won the toss and elected to field. The hosts then returned to overhaul the target with 11.1 overs to spare, riding on individual fifties by Chand (59) and Mandeep (59) and their 89-run third wicket partnership off 103 balls in the middle. Kedar Jadhav (30) and Ashok Maneria (37) then finished the job for India A, stitching an unbeaten 53-run stand in 45 balls as the hosts took an unassailable 2-0 in the three match series. Earlier, Carl Cachopa top-scored for New Zealand A with a 103-ball 80, which was studded with nine boundaries. It said four official proposals to host the men’s World Cup have been made, with a further three submissions being made for the women’s equivalent. Australia, England, India, Malaysia and New Zealand have all put “extremely strong cases forward” in an attempt to lure the sport’s top properties to their territory. The FIH had requested all countries that official bid questionnaires be submitted before the August 31. The FIH received official submissions from five of the original six nations that initially expressed interest . The next phase of the process will feature the detailed evaluation of each bid which will be followed by further discussions and clarifications with National Associations as well as site visits to each country. The final decision will rest with the FIH Executive Board in Lausanne (Switzerland), with the winning bids slated to be announced on November 7. “The FIH is thrilled to receive excellent response to host World Cup events in 2018", said Kelly Fairweather, FIH Chief Executive Officer. “I spoke to the wrestlers yesterday and they are ecstatic. The mood in Budapest is celebratory as all top wrestlers have reached the venue,” said Sushil. The senior Indian team is currently training at a camp in Hungary ahead of the championships starting September 16. The 66kg wrestler will be flying off to Budapest this week for the event but remains unsure of his participation. “My participation in the event will be ascertained after I reach there (Budapest),” he said. New Delhi: German Thomas Bach was elected president of the International Olympic Committee (IOC) on Tuesday, succeeding Belgium's Jacques Rogge and maintaining a European stranglehold on the most powerful job in world sport. The 59-year-old Bach, who is also the first Olympic champion to head the IOC, is the ninth president only in the body's 119-year history. Jaipur: Ace shooter and former Olympic silver medallist Rajyavardhan Singh Rathore on Tuesday decided to take a shot at politics as he joined the BJP after taking voluntary retirement from the Indian Army. The 43-year-old Colonel entered politics, contending that "I must not back out when the nation is faced with a different kind of threat". Kathmandu: India will host the 2015 edition of the SAFF football tournament, it was decided in the executive committee meeting of the South Asian body here on Wednesday. The meeting did not finalise the host city for the tournament but said it will be held in either New Delhi or Kerala. "India will host the 2015 SAFF Cup but the venue will be decided later. The fight is in between Delhi and Kerala to host the tournament," said SAFF`s general secretary Alberto Colaco. Ranchi: The 53rd National Open Athletics Championships ended here today in utter chaos with the closing ceremony, attended by state sports minister, being held in complete darkness for the entire period after a power blackout. Power went off as soon as the closing ceremony began at 6pm and the entire Birsa Munda Athletics Stadium descended into complete darkness. There was no alternative arrangement made for such an eventuality by the organisers and the ceremony, which lasted a little over an hour, continued with the state sports minister Geetashree Oraon being shielded by her security guards by forming a circle of human bodies around her. With the mike not working, the minister declared the Championships closed at the top of her voice and one official announced that Railways were the women's team and overall champions. Services were declared men's team champions. In bizzare scenes, the organisers were seen using their mobile phone headlights to read papers while making announcements. New Delhi: Shuttlers Ajay Jayaram and Anand Pawar will spearhead Indian challenge when they start their campaign in the men's singles competition of the China Masters Superseries tournament at Changzhou tomorrow. World number 24 Jayaram, who had a good run at the Indian Badminton League (IBL) last month, will take on Chen Yuekun of China, ranked 30th, while Pawar will be up against the top seed Chen Long tomorrow. While, Pawar, ranked 39th, is unlikely to cross the first hurdle, for Jayaram, the road ahead will be equally tough as he would need to get across the likes of fourth seed Tommy Sugiarto of Indonesia and sixth seed Jan O Jorgensen of Denmark.